I wonder about things. This has been a long week, working early, class, family stuff, trying to finish up some Christmas presents… and not done. That’s fine. They will be. I have been watching fairly sappy Christmas shows this evening and smiling, crying a little for missing my daughter yet happy about how wonderful she is. I miss her delightful laugh, the way she expresses herself, the beautiful woman she is growing into. I also miss some of the beautiful friends that I’ve made along the way and am grateful for them even though I don’t stay in touch as well as I ought to. Memories of past holidays keep creeping in – most very pleasant, a few that aren’t. When I was very young we would go downtown (Washington, D.C.) to look at all the lights and moving holiday displays in the store windows. I remember being amazed at all the beauty and how magical it all seemed. I remember one Christmas, I was about seven or so, unwrapping that perfect present – a jewelry box with a turning ballerina and wind up music box. Mom had found the very last one. Each Christmas she would take each of us, individually, shopping for the rest of the family and a dinner out. It was such a treat! We made mincemeat pies, the much maligned yet required fruitcake (hers was pretty good!) and best of all, the gingerbread houses. We were rarely allowed candy so it was a double bonus. Before I knew it, I was on my own. When my own children were young we would make gingerbread cake (and sometimes the houses) with whipped cream frosting for Jesus’ birthday cake. Somewhere along the way, the tradition of Muddy Buddies got started – rice or corn cereal with peanut butter, butter, vanilla then coated with powdered sugar. Now that Marci is grown and on her own and David is getting close I wonder how many more holiday seasons we’ll be together or apart and how they will be spent. It’s bittersweet. WRT’s step-grandkids will be at his home for part of the day, I’m trying to talk him in to putting up the tree. He’s not really feeling it this year any more than I am. It’s been a difficult year all the way around but there have been great moments sprinkled throughout. He spent half the day putting yet another new strut in my car. He was able to find the entire strut/coil assembly complete with spacer that was only available by special order last year. This so rawks! He so rawks!!!! Freeway driving without bouncing around on ice and snow is a real blessing. I spent a while washing walls, floor boards, stair rails, doors, wow the kids made a mess of his house over the year+ they lived there. There’s a lot more to be done but hey… there’s time, right? 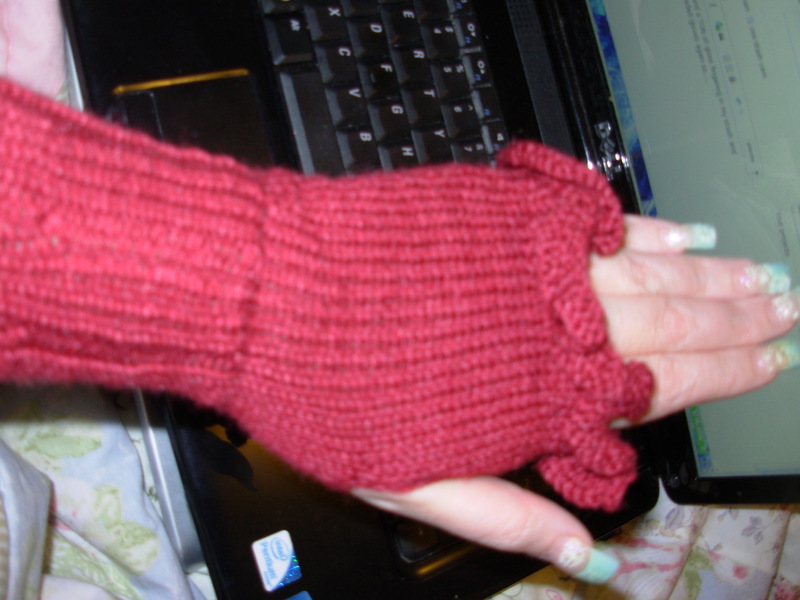 In knitting news…. 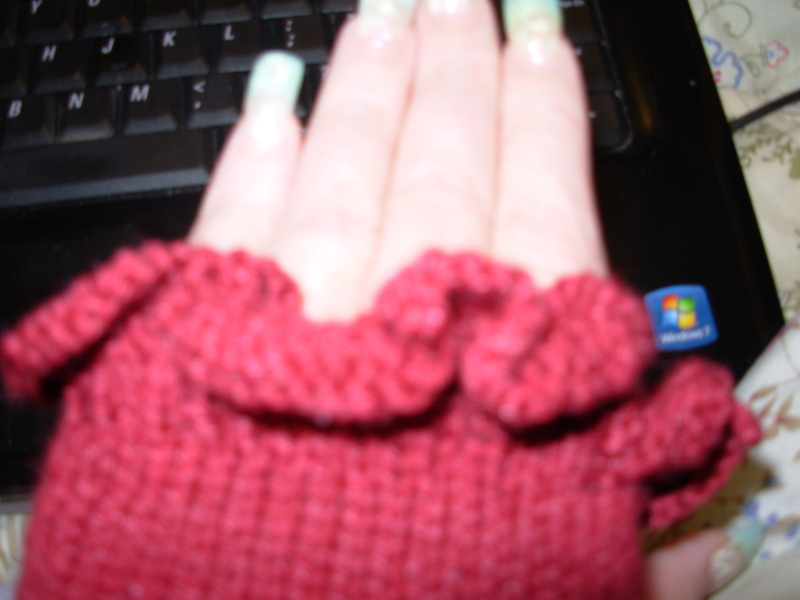 I made a new fingerless glove pattern up. I’ll try to get it written up and posted in the next week or two. 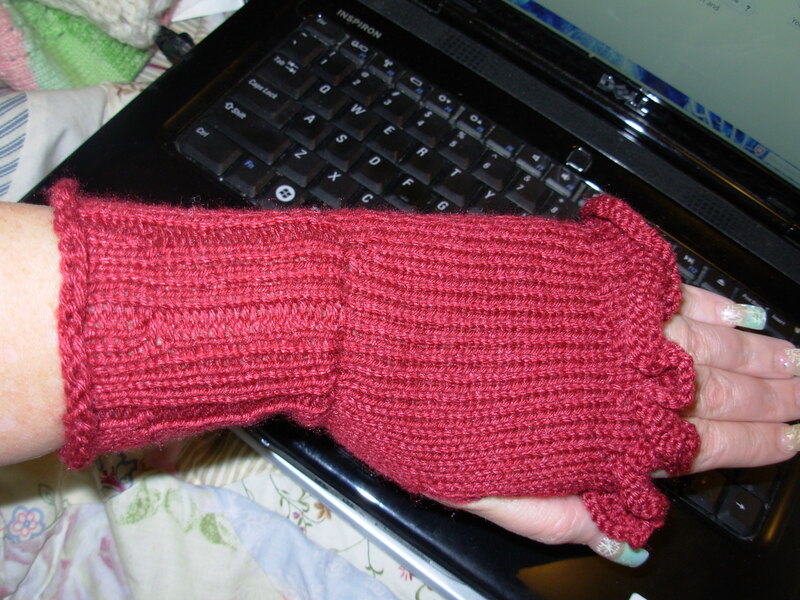 Hopefully, there will be a new cowl pattern to go with it but don’t want to get ahead of myself here. This entry was posted in knit, Life and it's Stuff. Bookmark the permalink.